Read this article before you write to us. 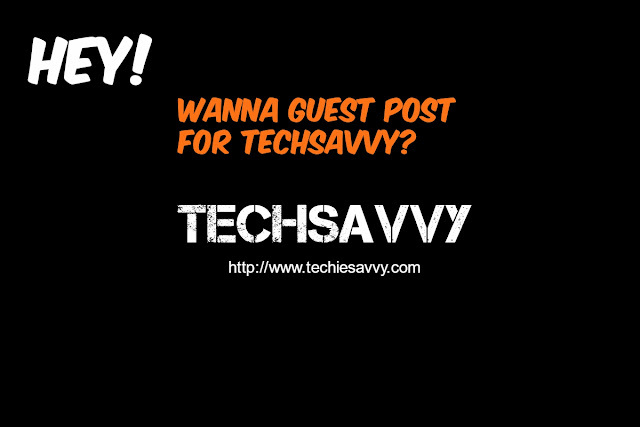 TechSavvy is a rather new blog. As such we need Guest Posts to increase our content size. In case you want to guest post in this blog, we allow two backlinks to your blog/site and one for your social profile - Google+, Facebook, Twitter (whatever!). Also, this will help you to increase your online presence and writing good posts here will help you in getting recognition as a good blog writer. More importantly, quality posts here will benefit users just like you in their pursuit of a review or comparison regarding some product. When you write here, your aim should be to write such a post that the viewer doesn't need to open another website to gain any more info. The post you write should be so detailed that no sites should have more information on the topic that you wrote on. This calls for good research. Make sure you scour the net to write the most detail packed article. However do not blabber useless things. No one has got the time and patience to go through useless talk. If you write a detailed post and the post becomes too long, people are going to bookmark your article and come back to finish it. However if your article contains useless blabber, people won't have the patience to go through it. Don't copy down some other article from the internet and post it here. Do it yourself. Do research. Poor quality posts or copied posts shall not be accepted. Also the images that you use shouldn't be taken from Google searches or other websites. Try to take images of the products yourself or the images that you have rights to or the images under creative commons license (google for free images!). If that isn't possible, you can take the image from shopping sites which lets you use its images like Amazon, whilst providing the URL, you got the image from, just below the image. And after you finish your post do send me the source URLs (the sites you referred to while creating your article) along with your post. Name of any site/blog (with URL) that you own or have contributed to (optional). Title of the topic on which you want to guest post.